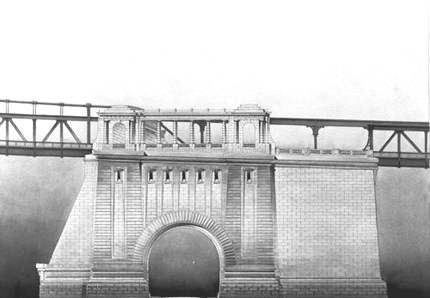 Search results for "New York City Department of Transportation"
An original drawing of the Manhattan Bridge archway by Carrere and Hastings. The archway is to reopen to the public this summer after decades of closure. 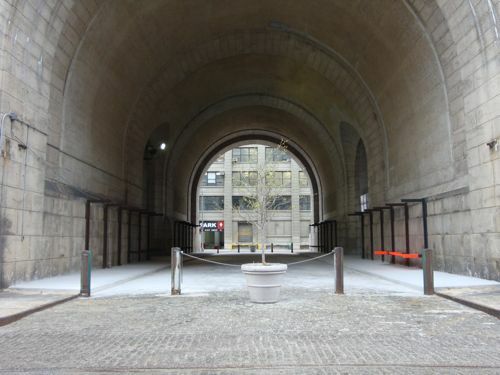 Long barred to the public, a stone-covered archway beneath the Manhattan Bridge in Dumbo is being reopened for public access this summer, revealing for the first time in decades the elegant public space designed by renowned Beaux Arts firm Carrère and Hastings, which created both approaches. Thanks to the advocacy of the Dumbo Improvement District, the archway is also expected to serve as a stage for a variety of public programming, as well as a temporary summer site for a public marketplace known as the New Amsterdam Market. The reopening of the historic archway, which is already publicly accessible, marks a significant milestone for advocates who have slowly been reclaiming the urban fabric around the bridge’s piers. “The archway connects Dumbo east to west. It’s crucial to the development of the neighborhood,” Kate Kerrigan, executive director of the improvement district, said in an interview. Work on the archway, which had previously been used for storage by the Department of Transportation (DOT), will improve pedestrian connectivity while providing a number of new design features to make it more amenable to the public. In collaboration with the improvement district, Rogers Marvel Architects has designed benches for the 45-foot-high, 7,000-square-foot space, along with subtle lighting to improve safety and to highlight the original architectural elements. 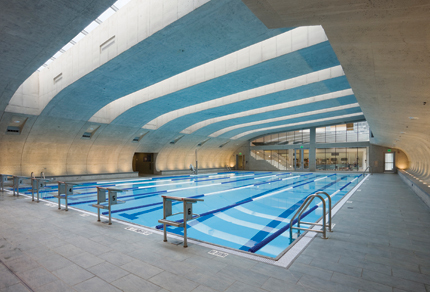 The stunning space is expected to host a variety of public events this summer. 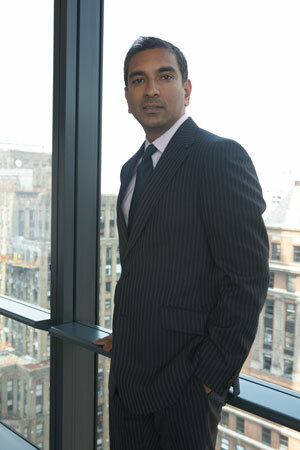 The new space would offer a stunning—if provisional—backdrop for the New Amsterdam Market, a project spearheaded by Robert LaValva, a former planner for the Department of City Planning who has evangelized for the role public markets can play as both civic gathering spaces and a key link in the sustainable supply chain. “My interest in urban systems comes from my background as a planner, in how the surrounding region can supply the city,” he said. If all goes as planned, the market is expected to make its debut at the archway on June 28. However, an official reopening date for the public space has not been set, and much of the site’s programming is still being formalized, according to the improvement district, which expects to announce archway events in the coming weeks. General gladness and near unanimous support greeted Mayor Bloomberg’s February 27announcement that he was malling Times and Herald squares by closing off portions of Broadway in the interest of easing traffic, widening sidewalks, and reclaiming some three acres for pedestrian use. The Regional Planning Association has been pitching the idea since 1974, and so the group’s president, Robert Yaro, was triumphant: “This plan is a win-win-win strategy for New York’s motorists, its residents, workers, visitors and property owners. All will benefit as the City’s Broadway plan is brought quickly to reality.” Streetsblog called it “a bold transformative new vision.” And what’s not to like? The $1.5million plan is supposed to reduce southbound motor vehicle travel times by 17percent on 7thAvenue, and northbound travel times by 37percent on 6thAvenue. And the Naked Cowboy will have someplace to sit down. The notion of banning cars on Broadway has reared up every decade or so since the 1960s, when a malling craze seized the entire country from Kalamazoo (where the first downtown pedestrian zone opened in 1959) to Atlanta. Only 15percent of 200pedestrian malls survived, according to Sam Staley, director of urban and land use policy at the Reason Foundation; the ones that did not were absent two essential ingredients: plenty of pedestrians and a unique sense of place, with viable retail. Those two are resoundingly on hand in Times Square, and always have been, along with efforts to subtract the traffic. In 1977, a $500,000federal grant was paid to the city to create an “experimental pedestrian mall” with trees and potted plants that—just like the one announced by Bloomberg—would become permanent if it worked. And that was the last we heard of a plan that made local businesses fear they’d lose curbside traffic; annoyed taxi drivers for the inconvenience; and flew against the city’s thinking at the time that only more and wider roads could make traffic flow faster. This time around, things are different, not least because the plan seems motivated in part by the mayor’s determination to have something highly visible go his way after congestion pricing went so wrong. The attitude of other stakeholders has also changed—except perhaps the taxi drivers—reflecting more enlightened thinking about public amenities and transportation. They get it now: Cars in the city are headed for extinction. And yet as radical as the plan is, it was disappointing to see it quite so completely devoid of design. As Deborah Marton, executive director of the Design Trust for Public Space, pointed out, “No one thinks these plazas should look this way. Just claiming the ground was kind of heroic; they can always go back and rethink the detailing.” That’s true, but why doesn’t the Department of Transportation, which is spearheading the plan, have a landscape design consultant on call to sketch up a vision that’s a little less ad hoc, more layered, and not so isolated from side streets? The agency’s so-called piazza islands—like the new pedestrian spaces at Madison Square and 14thStreet—are risible for their smatterings of cafe tables and glued-in-place gravel. Transportation Commissioner Janette Sadik-Khan deserves enormous credit for shaking the lead off this decades-old plan and making something happen that this time might stick. 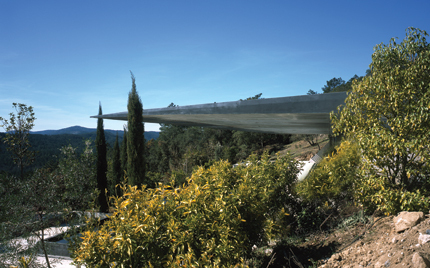 It’s still a shame, however, that landscape designers seem to belong to the second wave of the solution, not the first. 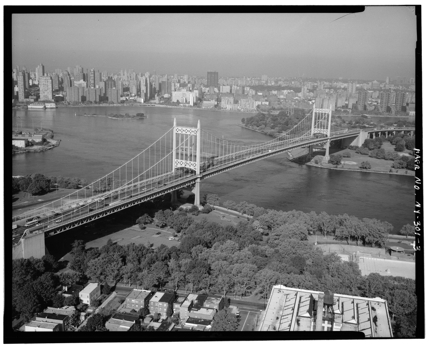 The Triborough Bridge was built in 1936 with $44.2 million from the Public Works Administration. In 1931, New York Governor Franklin Delano Roosevelt sat in on a roundtable conversation with the Regional Planning Association of America (RPAA) in Charlottesville, Virginia. There, RPAA members including Lewis Mumford, Benton MacKaye, and Clarence Stein presented the future president with a powerful argument that fallout from the economic collapse of 1929 might be best attacked by following a “new road” of regional planning at a national scale. The governor seemed sympathetic to their ideas, and helped MacKaye launch his ambitious plans for the Appalachian Trail, which began in New York State. Two years later, when FDR began the historic 100 days of legislation that kicked off the New Deal, the RPAA’s lobbying seemed to have paid off. Roosevelt placed MacKaye in a planning position with the Tennessee Valley Authority (TVA), and selected Stein’s partner, Robert Kohn, as the first head of the Housing Division of the Public Works Administration (PWA). But while the RPAA’s progressive goals were embodied in these programs, as the New Deal wore on, its idealism and the scale of its ambition became muddled through political compromises. MODELED AFTER ENGLISH GARDEN CITIES AND COMPLETED IN 1937, GREENBELT, MARYLAND WAS ONE OF THREE GREENBELT TOWNS CREATED UNDER THE FEDERAL RESETTLEMENT ADMINISTRATION. 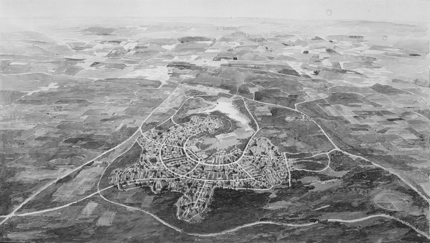 The Greenbelt Town program, which was supposed to change the face of America with a series of highly rational garden cities, was whittled down to three small projects. And the TVA’s initial steps toward creating a “dynamic regional and interregional economy” were soon shed by its director, Arthur Morgan, who steered the authority toward becoming merely a source of electricity for the industrializing south. This tension—between those with plans to use government action and money to transform the country and those who prefer a more laissez-faire approach focused purely on temporary job creation—is very much alive today as the American Recovery and Reinvestment Act of 2009 (ARRA) works its way through Congress. Like today’s stimulus package, the New Deal started as a jobs-creation program, but it gave rise to profound changes in the landscape and culture that were a natural outgrowth of the era’s newfound belief in the federal government’s ability to play a transformational role. As we debate what many call “the New New Deal,” the lessons of the 1930s remind us that a focus on job creation need not preclude a commitment to the broader progressive agenda that made the New Deal so far-reaching. The New Deal’s largest and best-known agency, the one that became synonymous with the entire program, was the Works Progress Administration (WPA). Enacted in 1935, it received more money and attention than any other of the Roosevelt administration’s initiatives. By 1941, the WPA had spent approximately $11.4 billion ($169 billion in today’s money). Of this massive investment, $4 billion went to highway and street projects; $1 billion to public buildings; $1 billion to publicly owned or operated utilities; and another $1 billion that funded initiatives as varied as school lunch programs, the famous Federal Writers Project, and sent photographers like Dorothea Lange and Walker Evans out to document the American landscape. By the time it was disbanded by Congress in 1943 as a result of the manufacturing boom created by World War II, the WPA had provided some eight million jobs and had left its mark on nearly every community in America by way of a park, bridge, housing project, or municipal building. 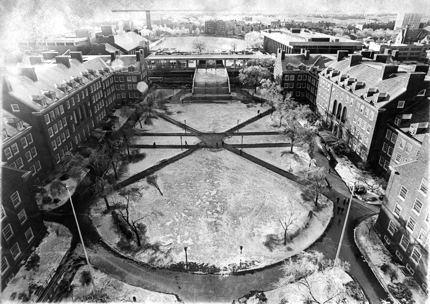 in 1935, the Public works administration allocated $5 million for the original brooklyn college campus. The magnitude of the change created by the WPA’s modernization program was unprecedented among direct federal interventions, and the current recovery bill has the potential to be as, or more, effective. At this writing, ARRA promises $825 billion in economic stimulus, $275 billion of which is tax cuts and $550 billion of which is actual investment. Much of this $550 billion will go to construction projects to bring America’s flagging schools, health care facilities, and infrastructure up to standard and beyond. A recent analysis of the bill from the American Society of Civil Engineers (ASCE) gave the following run-down on infrastructure spending: $30 billion for highways, $9 billion for transit, $1.1 billion for Amtrak, $10 billion for science facilities, $3 billion for airports. 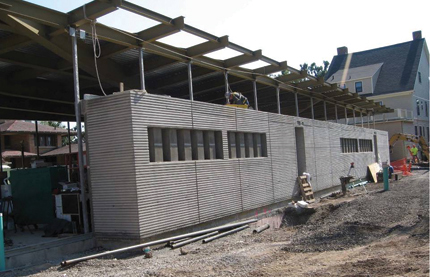 The list goes on, including appropriations for clean water and restoration of brownfields, but also money for other architecture-related building work: $16 billion for school modernization, $9 billion for Department of Defense projects like VA hospitals and child care centers, and $2.25 billion for rehabilitating public housing. While the rough balance of funds in the current bill and the WPA evinces a kinship, they will be disbursed in a very different fashion. Harry Hopkins, FDR’s handpicked director of the WPA, worked directly with the states to evaluate and select projects. Other agencies, such as the National Recovery Administration (NRA) and the Public Works Administration (PWA), also had their own directors, their own budgets, and the power to choose how best to spend them. The money in the current stimulus package will be apportioned to the states not through newly created agencies based in D.C.— as was the case in the 1930s—but by existing formulas. These formulas evaluate the needs of various localities by calculating factors that range from demographics, to income levels, to official reports on structures and efficiencies. The formulas have the benefit of distributing funds by objective measures rather than political ones, as goes one criticism of the WPA. However, these measures change little from year to year, and a formula-based system has done little to address infrastructure failings at a regional or even national scale. 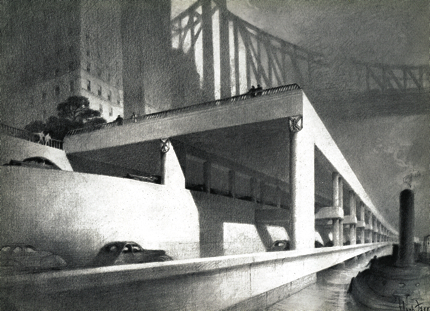 the 1940 segment of manhattan's east river drive, sketched by hugh ferriss, received a pwa grant for $4.8 million. What has not changed between now and then is the imperative to choose projects that are ready to start construction immediately. 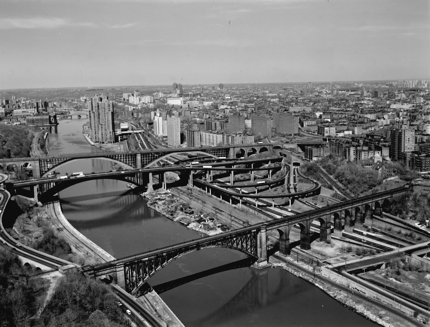 What we might call “shovel-ready” projects were a big part of the WPA agenda, and there were a number of regional plans in place, notably those developed by Robert Moses in New York, that captured an enormous share of federal funds. By 1936, New York City was receiving one seventh of the WPA allotment for the entire country, employed 240,000 people with this money, and was considered “the 49th state” within the WPA. Meanwhile other municipalities floundered in their attempts to draw up plans, and the WPA canceled more than 100 major grants to 11 northeast cities because the blueprints for those projects were not ready. Today’s analog is the “Use it or Lose it” provision in the bill that demands the return of funds if they are not put to work within 120 days. Because of this urgency, many are wary that we will spend $100 billion filling potholes. There are a few significant projects in New York that promise to make a real difference to the region. One is Access to the Region’s Core, or the ARC tunnel, which will improve transportation between New Jersey and Manhattan. East Side Access, a project that will do the same thing for commuters coming from Long Island, is already under construction, but in dire need of funds. The same can be said for the MTA’s 2nd Avenue Subway project. And then there’s the Fulton Street Transit Center, which promised to become a central element of downtown’s redevelopment before the MTA’s own parlous financial situation put it in jeopardy. These projects, which stand to receive substantial stimulus funding, will undoubtedly improve transportation in the New York region and lay the groundwork for increased demand in the future. But what about transportation between New York and Boston, or New York and Chicago? What about developing a framework for wind power in the tri-state area? 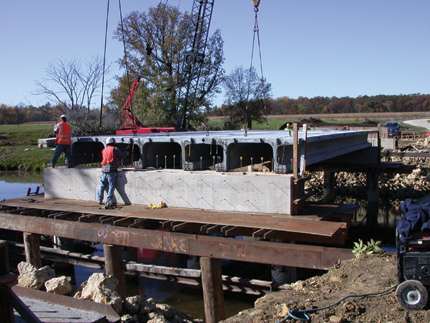 What about a comprehensive plan for regional watershed management? 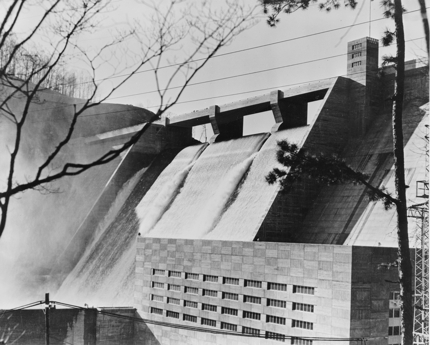 the new deal's heroic ambition is exemplified by the tennessee valley authority's norris dam, completed in 1936. 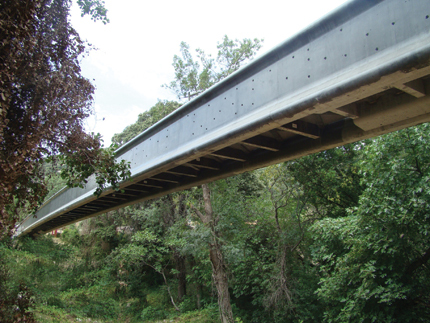 There is no agency to think about the changing infrastructure needs of the country as a whole. In 2007, a bill was put forth to do just this: The Infrastructure Investment Bank Act would have established a national institution to evaluate project proposals and assemble investment portfolios to pay for them, much like the World Bank does on a global level. The fact that it did not pass Congress speaks to a reluctance in the U.S. to put planning power in the hands of the federal government—the same reluctance that the RPAA came up against in the 1930s. One of Roosevelt’s first acts of the New Deal, an act some say he first mentioned at that RPAA roundtable meeting in Virginia, was the creation of the TVA. This ambitious project targeted the poorest part of the country, the one hardest hit by the Depression, and took it upon itself to modernize and reinvigorate it. Through a comprehensive regimen of education and infrastructure building—including the construction of 29 hydroelectric dams and even the building of one town—the TVA turned this rural backwater into the nation’s biggest producer of electricity, and one of the backbones of mobilization during WWII. Though it faced determined opposition, and proposals to implement similar regional plans were shot down across the country, the TVA stands as a high water mark. After the Interstate Highways Act of 1956, the federal government covered 90 percent of costs for road construction, like the 1963 Alexander Hamilton Bridge. The only time in American history that the federal government has been able to enact a national plan was through the Federal Highway Act of 1956, a project whose skeleton was drafted by the NRA during the Depression. While many today dispute the merit of this program, it is instructive to note that the only way Eisenhower was able to sell the highway act to the country was by declaring it vital to national security. Today we face not nuclear Armageddon but a danger that could, in the long run, prove all the more crippling: our national infrastructure on the brink of collapse. It seems time to draft our own “new road,” one designed not just to pull us out of economic crisis, but also to lay the groundwork that will carry us undiminished into the future. When my wife and I visited Lebanon in 1998, we rented a little Renault and spent a couple days on the road, and saw one working traffic light the entire time. The streets of Beirut were packed with a chaotic tangle of aggressive, pushy cars, and I was sure we’d hear steel shrieking on steel the moment we rolled off the car rental lot. We safely got out of the city, and while driving on the winding, two-lane Damascus Road in the foothills of the Chouf mountains, we found ourselves driving next to another car, each going at a good clip. Just then, a third car roared between us, making its own lane. I realized at that point on Lebanon’s roads, all bets were off. And yet, for the rest of our visit, I became more and more convinced that this was one of the safest places I’d ever driven: It was predictably unpredictable. The time many of us spend getting from one place to another comprises most of our interactions with fellow citizens; it is as much a social experience as anything else. 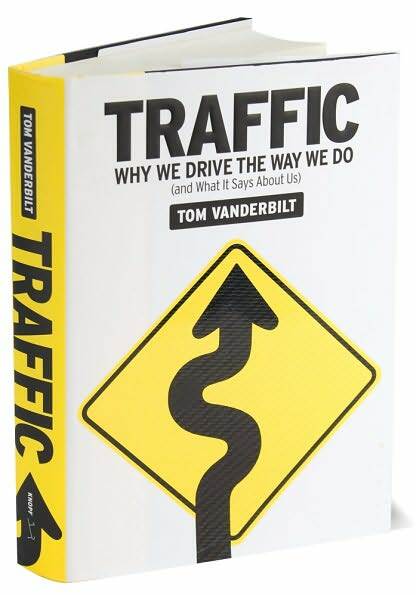 Since time in the car shapes our impressions of each other and of our cities, it might explain the appeal of Tom Vanderbilt’s Traffic: Why We Drive the Way We Do (and What It Says About Us). Vanderbilt adroitly navigates a mountain of findings and opinions from traffic engineers, economists, psychologists, and even entomologists. Like an excited and precocious teenager, he parenthetically mentions one psychological study while describing another, adding, “more on that later.” But far from being overwhelmed, the reader is swept up in his enthusiasm. Traffic is the latest in a series of books like Freakonomics and The Tipping Point that draw on diverse and sometimes arcane academic fields to create a coherent narrative for the lay audience. But I hope Vanderbilt will reach more than the casual reader: Planners, architects, and policymakers would do well to read his book. Perhaps Traffic can best be summed up by one of its innumerable takeaways: You don’t drive as well as you think you do. And if you knew this, you’d drive better. But we don’t even know what we don’t know. That Rumsfeldian quip alone sums up so much about how we behave on the road that awareness of it on our part would make us safer as motorists, cyclists, and pedestrians. Also, awareness of behavior among the people who design our roads and set transportation policy could change our cities for the better. Traffic engineers—who, for the most part, do not appear to be familiar with many of the psychological studies cited in Traffic—try to make our roads safer with more signage, wider lanes, shoulders, and gentler curves. But a growing number of dissidents are pointing out that a safe environment, surprisingly, is one that appears to be dangerous, because it forces us to be more attentive. The idea that the perception of danger is good for us runs counter to standard reasoning in road design, which argues that since people will make mistakes, the road should provide a comfortable margin of error. This is generally thought to have worked well on highways and arterials, but in cities and towns where different types of users vie for a share of the same space, designing a margin of error into a road for the benefit of motorists is dangerous. They’ll just typically drive faster around that turn, and they’ll be less attentive in that wider lane. To paraphrase the late Hans Monderman, a Dutch traffic engineer whom Vanderbilt interviews, when you treat people like idiots, they will behave like idiots. Monderman also features prominently in David Engwicht’s Mental Speed Bumps: The Smarter Way to Tame Traffic, a slim and entertaining read that, while nowhere near as broad in its scope as Traffic, is nonetheless insightful. Engwicht, an Australian traffic consultant whom Vanderbilt discusses, had grown increasingly frustrated with the standard traffic-calming measures like speed bumps, neckdowns, and chicanes, and began to develop strategies to deal with aggressive driving in a completely different way. Rather than use negative stimuli to get people to slow down, he argues for positive stimuli—intrigue, uncertainty, and even humor—to engage motorists in their social environments. In other words, pull motorists out of the “traffic world” and into the “social world”—make them interact with each other and with others on the street via eye contact. The streets of New York City display engineers’ best efforts to introduce predictability for motorists into a town rich in intrigue and uncertainty. They seem always to be fighting an uphill battle: There is nothing to be done about falafel guys pushing their carts in the streets, or brooding hipsters jaywalking while glued to their iPhones. Unfortunately, some of New York’s long-standing policies reinforce the misguided efforts of traffic engineers, and are pulling us out of the social world and into the traffic world. As Donald Shoup observes in his excellent book, The High Cost of Free Parking, the off-street parking minimums that city planning departments require of builders wildly distort the transportation market and wreak havoc on the public realm and on real estate development. The transportation market is distorted because motorists receive a benefit at low cost, subsidized by everyone. When presented with free goods, we consume them. A professor of urban planning at UCLA and an economist by training, Shoup, who is also profiled in Traffic, is an engaging and passionate thinker, and The High Cost of Free Parking, while it looks thick enough to stun an ox, is as entertaining as it is informative. The book pulls the curtain aside, revealing all the parking space calculations for what they are: best guesses, often padded, and often based on just a single survey of actual conditions. Or, as Shoup says, “pseudoscience.” This pseudoscience is driven by the notion that parking lots should be able to handle peak demand. A Toys R’ Us parking lot has to accommodate shoppers the day after Thanksgiving. But what about the other 364 days of the year? This might seem irrelevant to New Yorkers, whose neighborhoods are more likely to have parking maximums than minimums; however, there are a surprising number of minimums in place, especially for new development. Even plans for dense areas of New York—Hudson Yards, Willets Point—include shockingly high numbers of parking spaces. As Shoup argues, parking not only meets demand, it fuels it. Traffic, Mental Speed Bumps, and The High Cost of Free Parking are all testaments to the complexity and centrality of social interactions and behavioral economics to our public lives and the fabrics of our cities. Drawing primarily from observations about psychology and economics, these authors show us that what characterizes our cities is much more than an aesthetic experience, traffic flow, or standard land-use metrics. The best urban thinking is done by those who truly observe and understand how we behave. As we mentioned Tuesday, there was some confusion as to who had won the CityRacks Design Competition--held by the city's Department of Transportation, the Cooper-Hewitt, and Transportation Alternatives--given that no official announcement had been made last week. Whether Bustler's report impacted the decision or not may never be known, but it was the "Hoop" (above) and not, as predicted, the "Alien" (after the jump) that carried the day. 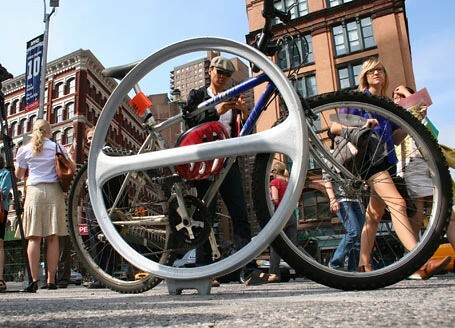 Ian Mahaffy and Maarten De Greeve of Copenhagen beat out 200 challengers, including 10 finalists, to be named kings of New York City bike racks. In addition to the $10,000 prize they will receive, some 5,000 hoops will be installed throughout the city in the next three years. "The jury was convinced that the Mahaffy and De Greeve design will best meet the City's bike parking needs and generate greater interest in cycling," DOT head Janette Sadik-Khan said in a statement. 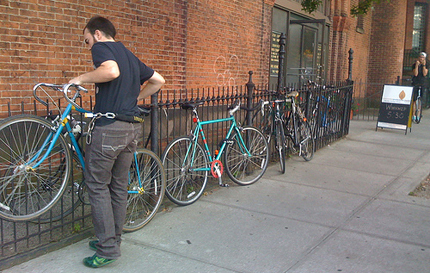 The competition also honored two designs for indoor bicycle parking, which should come in handy now that the city is advocating a zoning change to require bike garages in new large-scale developments. When I first received Parks Commissioner Adrian Benepe’s 2007 greeting announcing PlaNYC, I felt a great wave of exhilaration—probably the same one experienced by all architects, landscape architects, and planners who have fantasized about a nascent era of great design sponsored by visionary leadership in City Hall. Office interiors were spruced up, websites revised, and principals’ sartorial splendor amplified in anticipation of knocks at the door from beneficent developers and eco-conscious politicians who would beseech us to create the New York City of tomorrow. As my fantasy faded to something resembling reality, I tried to grasp the magnitude of the gauntlet thrown down by the mayor. With selfish concern for my own studio’s chances of participation in this metropolitan dream, I also wondered whether there would ever be a significant opening up of the job market for small design firms—or would all the request for qualifications (RFQ) documents arrive with their onerous requirements for mega-building experience, multimillion-dollar liability protection, hundreds of consultants under one roof, and the thinly veiled implication that success depended on the invitee’s ability to invest in competitive bidding (with free design services tossed in to sweeten the deal)? By the time Adrian’s call for designer involvement in an expanded parks program arrived, my enthusiasm for PlaNYC had been diminished by memories of futile efforts to break into New York’s public space job market. Since my firm, SITE, is an architectural practice that focuses on parks and plazas (but mostly works abroad, where there is less resistance to innovative solutions and green principles), I could see the handwriting on the wall: The future would be sponsored, controlled, designed, and built by the same cast of characters that has dominated the city’s architecture and planning markets for the past 30 years. Clearly, the tasks outlined in PlaNYC—repairing infrastructure, constructing affordable housing, reducing traffic, improving mass transit, and saving energy—are top priorities. But by focusing on these imperatives, an investment in imaginative ideas for the social, psychological, and aesthetic resolution of parks, streets, and gardens should not be assigned to the back burners. (Just look at Detroit and Cleveland!) The usual tactic of favoring operational efficiency and restorative technology, at the expense of social interaction and access to nature, has demonstrated how such legislative abandonment can destroy the very “quality of life” that a massive investment in infrastructure is meant to preserve. My fear that New York’s grand park plans may become another blueprint for business as usual was confirmed by news accounts early in the game. When the mayor’s original challenge was issued in December 2007, it proposed to open 90 percent of the city’s waterways for recreation by limiting water pollution and preserving our natural areas. But earlier that year, the Regional Plan Association was already complaining that the city had planned for more park expansions than it could afford. This suggests that public space may become PlaNYC’s first casualty, and I suspect that similar economic and political inertia will thwart the mayor’s water, transportation, energy, and air improvement agendas. Still, in the hope that such initiatives may succeed, I want to emphasize a few issues that have enormous impact on the way our city’s parks and gardens have been shaped until now, and on how they will be designed in the future. It is no secret that most public spaces constructed in New York over the past two decades have been based on Modernist traditions. The ingredients invariably include a massive slab of concrete, donut fountains, “plop art” sculptures, and a scattering of park benches. The reasons for this formulaic consistency can be found in the politics of architectural employment and the entrenchment of a Robert Moses–era planning legacy. Clearly, we can do better. But for a flexible climate of creativity to succeed, city agencies must first provide a less labyrinthine and preferential RFQ process. It should certainly encourage smaller architecture and landscape offices to compete for city commissions by placing more value on the applicant’s track record of creativity. Since the criteria for what constitutes “creativity” can vary according to taste and time, the Parks Department might do well to sponsor a monthly series of public-space design symposia, where new talents would have a chance to showcase their visions and learn more about RFQ procedures. City Hall and the Parks Department can improve the RFQ process, but they obviously can’t legislate better design. For this reason, I have a few items of cautionary advisement to offer. First, there should be enough memorable features in a park or plaza to encourage people to travel out of their way to see the space and, after leaving, tell their friends about it. Second, public space is successful to the degree that people look attractive to each other and are encouraged to interact in new ways. Designers should be sensitized to “prosthetic engagement,” where body movement and pedestrian interaction become as much a part of the raw material of design as paving, steel, and vegetation. Third, parks, plazas, and gardens should involve all of the senses in equal measure. And fourth, the design of public space today includes an awareness of “integrated systems.” This suggests a design philosophy based on understanding the parallels between the components of electronic communications and their symbiotic equivalents in nature. If Mayor Bloomberg expects his plea for new ideas to reach high fertility, his passion for change must reflect a more psychologically engaging and aesthetically innovative brand of street and park life for New York City. There must also be support for a truly civic-minded “mandate for change.” Today, this means green and sustainable. By Manhattan standards, being green is a rather restrained and puritanical notion—the antithesis of Big Apple optimism. If the green movement ever expects to conquer New York, it must reverse its scold tactics and provide the same kind of inspiring catalyst for change that the industrial revolution offered our flamboyantly receptive island over a hundred years ago. This means shaping and selling a persuasive new “philosophy of the environment.” Come on Mayor Bloomberg, let’s go for it! 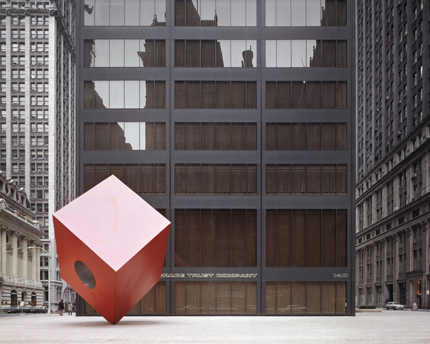 Skidmore, Owings & Merrill's 140 Broadway, completed in 1967, with Isamu Noguchi's Red Cube. When I first received Parks Commissioner Adrian Benepe’s 2007 greeting announcing PlaNYC, I felt a great wave of exhilaration—probably the same one experienced by all architects, landscape architects, and planners who have fantasized about a nascent era of great design sponsored by visionary leadership in City Hall. Office interiors were spruced up, websites revised, and principals’ sartorial splendor amplified in anticipation of knocks at the door from beneficent developers and eco-conscious politicians who would beseech us to create the New York City of tomorrow. As my fantasy faded to something resembling reality, I tried to grasp the magnitude of the gauntlet thrown down by the mayor. With selfish concern for my own studio’s chances of participation in this metropolitan dream, I also wondered whether there would ever be a significant opening up of the job market for small design firms—or would all the request for qualifications (RFQ) documents arrive with their onerous requirements for mega-building experience, multi-million-dollar liability protection, hundreds of consultants under one roof, and the thinly veiled implication that success depended on the invitee’s ability to invest in competitive bidding (with free design services tossed in to sweeten the deal)? By the time Adrian’s call for designer involvement in an expanded parks program arrived, my enthusiasm for PlaNYC had been diminished by memories of futile efforts to break into New York’s public space job market. Since my firm, SITE, is an architectural practice that focuses on parks and plazas (but mostly works abroad, where there is less resistance to innovative solutions and green principles), I could see the handwriting on the wall: The future would be sponsored, controlled, designed, and built by the same cast of characters that has dominated the city’s architecture and planning markets for the past 30 years. Clearly, the tasks outlined in PlaNYC—repairing infrastructure, constructing affordable housing, reducing traffic, improving mass transit, and saving energy—are top priorities. But by focusing on these imperatives, an investment in imaginative ideas for the social, psychological, and aesthetic resolution of parks, streets, and gardens should not be assigned to the back burners. (Just look at Detroit and Cleveland!) The usual tactic of favoring operational efficiency and restorative technology, at the expense of social interaction and access to nature, has demonstrated how such legislative abandonment can destroy the very “quality of life” that a massive investment in infrastructure is meant to preserve. My fear that New York’s grand park plans may become another blueprint for business as usual was confirmed by news accounts early in the game. When the mayor’s original challenge was issued in December 2007, it proposed to open 90 percent of the city’s waterways for recreation by limiting water pollution and preserving our natural areas. But earlier that year, the Regional Plan Association was already complaining that the city had planned for more park expansions than it could afford. This suggests that public space may become PlaNYC’s first casualty, and I suspect that similar economic and political inertia will thwart the mayor’s water, transportation, energy, and air improvement agendas. Still, in the hope that such initiatives may succeed, I want to emphasize a few issues that have enormous impact on the way our city’s parks and gardens have been shaped until now, and on how they will be designed in the future. It is no secret that most public spaces constructed in New York over the past two decades have been based on Modernist traditions. The ingredients invariably include a massive slab of concrete, donut fountains, “plop-art” sculptures, and a scattering of park benches. 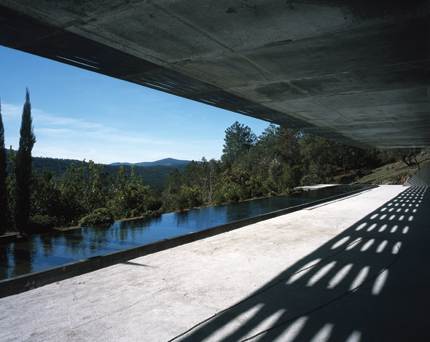 The reasons for this formulaic consistency can be found in the politics of architectural employment and the entrenchment of a Robert Moses–era planning legacy. Clearly, we can do better. But for a flexible climate of creativity to succeed, city agencies must first provide a less labyrinthine and preferential RFQ process. 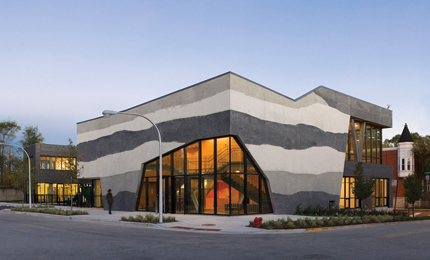 It should certainly encourage smaller architecture and landscape offices to compete for city commissions by placing more value on the applicant’s track record of creativity. Since the criteria for what constitutes “creativity” can vary according to taste and time, the Parks Department might do well to sponsor a monthly series of public-space design symposia, where new talents would have a chance to showcase their visions and learn more about RFQ procedures. City Hall and the Parks Department can improve the RFQ process, but they obviously can’t legislate better design. For this reason, I have a few items of cautionary advisement to offer. First, there should be enough memorable features in a park or plaza to encourage people to travel out of their way to see the space and, after leaving, tell their friends about it. Second, public space is successful to the degree that people look attractive to each other and are encouraged to interact in new ways. Designers should be sensitized to “prosthetic engagement,” where body movement and pedestrian interaction become as much a part of the raw material of design as paving, steel, and vegetation. Third, parks, plazas, and gardens should involve all of the senses in equal measure. And fourth, the design of public space today includes an awareness of “integrated systems.” This suggests a design philosophy based on understanding the parallels between the components of electronic communications and their symbiotic equivalents in nature. If Mayor Bloomberg expects his plea for new ideas to reach high fertility, his passion for change must reflect a more psychologically engaging and aesthetically innovative brand of street and park life for New York City. There must also be support for a truly civic-minded “mandate for change.” Today, this means green and sustainable. By Manhattan standards, being green is a rather restrained and puritanical notion—the antithesis of Big Apple optimism. If the green movement ever expects to conquer New York, it must reverse its scold tactics and provide the same kind of inspiring catalyst for change that the industrial revolution offered our flamboyantly receptive island over a hundred years ago. This means shaping and selling a persuasive new “philosophy of the environment.” Come on Mayor Bloomberg, let’s go for it! The City Council’s Housing and Buildings Committee unanimously passed legislation earlier today that will remove the requirement that the commissioner of the Department of Buildings be a licensed architect or engineer. Though the new legislation still mandates that either the commissioner or the first deputy commissioner be a licensed professional, a number of industry groups opposed the move, which is expected to pass the full council at today’s meeting. The bill was part of a major package of reforms proposed in the wake of the recent crane collapses that led to the resignation of the former commissioner, Patricia Lancaster. Because Lancaster was herself a licensed architect, a number of professional organizations, including the local chapter of the AIA, said architects and engineers were being blamed for the shortcomings of other professionals and the department itself. Executive Director Ric Bell, who recently wrote about this issue in AN, is in Richmond, Virginia, attending the annual AIA CACE meeting, but he did send an email to express his frustration. 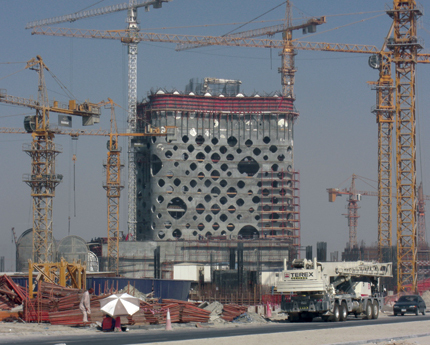 “Having an architectural or engineering license demonstrates that the commissioner knows how buildings are built and reassures those walking past construction sites that an important knowledge base is there at the highest level of authority with the department," Bell wrote. Asked whether Robert LiMandri, the acting commissioner who has been with the department since 2002 but is not a registered architect, would now be named full commissioner, Department of Buildings spokesperson Kate Lindquist directed comments to the mayor’s office, which did not immediately respond. Should the bill pass the council, it will require Mayor Bloomberg’s signature, but considering he proposed the stauncher bill that eliminated any requirements, his approval is expected. 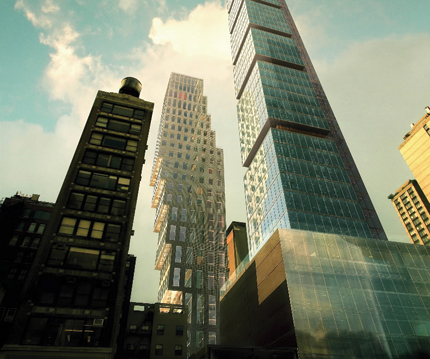 The council was also due to pass two bills related to construction site safety, one that would require contractors pouring 2,000 cubic yards of concrete or more to hire on-site safety inspectors—in order to prevent accidents like the one earlier this year at the Trump Soho—and another that requires detailed site safety plans for any “major” project, which Quinn described as “essentially larger than ten or twelve stories.” This would include a specific safety training regimen for workers. There were two other bills of note, the first of which will penalize stores that run air conditioners while leaving their front doors open. The cold air spilling onto the street may lure in customers, but it also wastes energy and taxes the grid, according to council members, leading to power failures. The other bill mandates the creation of a decennial waterfront plan. “We are basically a city of islands,” Quinn said. “For a long time, we have turned our back on them. Now that we are returning to the water, we must balance our use between recreation, transportation, economic development, and residential property, where appropriate." Update: The final vote on the commissioner bill was 41-8. Update: As predicted, Mayor Michael Bloomberg just announced his plans to permanently promote LiMandri to commissioner of the Department of Buildings. In the city's release, LiMandri thanked the mayor and the council for their continued support, adding, "The Department's mission of public safety requires a commitment from every one of us, including property owners, builders, construction workers and the members of my dedicated staff, and we must combine our efforts to ensure millions of New Yorkers are better protected than ever before. Short-cutting safety in the name of development is not an option, and anyone who puts people at risk will not be tolerated. Now let's get to work."